One of the most critical aspects of an email marketing campaign is timing. You can write the perfect subject line with a combination of the most enticing copy and attention-grabbing images but it all goes to waste if the user hits that dreaded ‘delete’ button. It makes sense that this scenario happens quite often in the over-crowded world of emails. Just put yourself in the consumer’s shoes and you will see what I mean. Every morning you open your email inbox and there are tons of promotional emails competing for our attention and only a few (if any) make the cut. In this kind of cluttered and competitive landscape, every aspect of an email campaign becomes mission-critical, including the day of the week and the time of day that you send it. Without further ado, let’s take a look at some data that HubSpot was so generous to provide. They conducted a study of over 20 million emails delivered over a 10-month period to identify patterns. 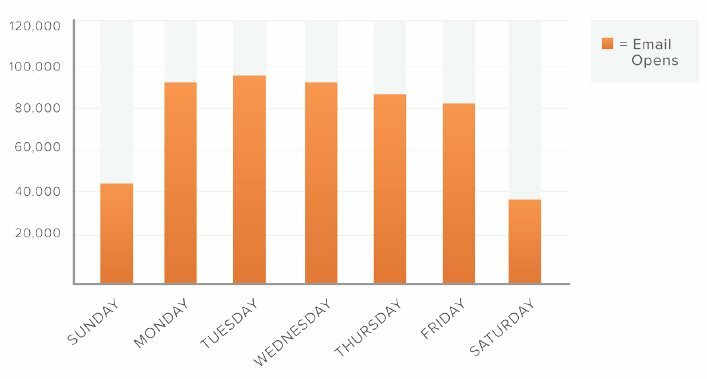 Based on the data, Monday, Tuesday and Wednesday have the highest open rates for emails. To be even more specific, Tuesday, for some reason, seems to be the best day to send an email with 20% more opens than average. Open rates decrease towards the end of the week, hitting their lowest on Saturday. If you must send an email on a weekend, Sunday seems to be better than Saturday. Picking the right day is an excellent start but it’s not enough. We need to be cautious about the time of day that we send our emails, which becomes a little more tricky, especially if you live in North America where you technically have 9 different times zones. But according to the research data, the most optimal time to send an email seems to be between 10 AM and 12 PM EST (11AM to be more specific). But this data is for weekly average and they wanted to see what it was like for each individual day of the week. And it looks like the time of day stays the same for each day except Sunday, which has a 9 PM EST timing that sees a 35% higher open rate than the average of the day. The best day to send an email during the week is Tuesday, followed by Monday and Wednesday. The best day to send an email on the weekend is Sunday. The best time to send an email on Monday through Saturday is 11 AM EST. The best time to send an email on a Sunday is 9 PM EST.